Monica Smith overcame many obstacles to establish herself in the US after moving here from her home country of Colombia. Transitioning her career path from the field of industrial engineering into the field of accounting, was the biggest challenge she was facing after her move. 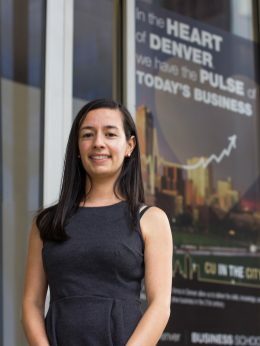 CU Denver smoothed that transition by giving her the education and connections to navigate the business world. Smith’s dedication and commitment to pursuing her dream job in accounting brought her to CU Denver, and now she’s been given opportunities to grow and learn in ways she was never exposed to in Colombia. Smith always knew she would one day leave her home country of Colombia. Her first visit to the United States almost a decade ago was through a program where she lived as an au pair for a family in Parker, Colorado. She chose to take a year off from college, an uncommon choice, to work in the program and focus on learning English. After the program ended, Smith went back to Colombia to finish her bachelor’s degree in industrial engineering before coming back to Colorado to marry her husband. In Colombia, industrial engineering was a very good career for her because of its diversity and demand for talent. There she was able to oversee production and management of projects while using her mathematically-inclined mind. Here in the US, she struggled to find work as an engineer. Smith had to wait until she got her paperwork, work permit, and become a resident before she could work as an engineer in Colorado. While she was waiting for the paperwork to process, she managed some accounting for her husband’s car dealership. After vigorous searching, she found herself working in an administrative role at a mining company called Golden Minerals Company. Operating a non-producing mine in Mexico, the company still manages the mine’s care and maintenance. Since starting in an administrative role, she saw the company as a great place for growth. Now employed for over five years, she is taking advantage of professional development opportunities offered by her employer to pursue her master’s in accounting. When researching colleges, Smith knew she wanted to get her degree at CU Denver. After securing funding through her company, she enrolled in her first three online courses this past summer. Her experiences at CU Denver so far have been much more eye-opening than she was expecting from her past college experience in Colombia. She expanded, “I think it is absolutely amazing because of the amount of resources they have here.” By working with the Business Career Connections team, she built her resume for interviews. This past year, Smith attended the Deloitte accounting panel where she had the opportunity to meet and interact with four women who worked in four different accounting firms. These women shared tips on how to interview and what they look for in potential interns. “I have not really had that many other opportunities to interview with companies, so I thought this event was really valuable for me,” Smith said. She networked with those women and was able to receive feedback that can be difficult to ask for in an interview setting. From opportunities like these, Smith has gained an abundance of valuable information on how to prepare for a professional job in an accounting firm. She now understands the different standards for jobs in the US compared to in Colombia. Smith noticed how the companies at these kinds of events go the extra mile to give students something more than just their education. CU Denver alumni and business community members have taught her how to act and succeed in a professional setting. Smith is gaining impactful insight into the different paths people take to reach their goals. She is inspired to continue her education and walk her own path to success through hard work and determination.